When we think Gauchos, we think Argentina. We think high quality steaks, full-bodied red wines and, possibly, some hunky Latino cowboys. 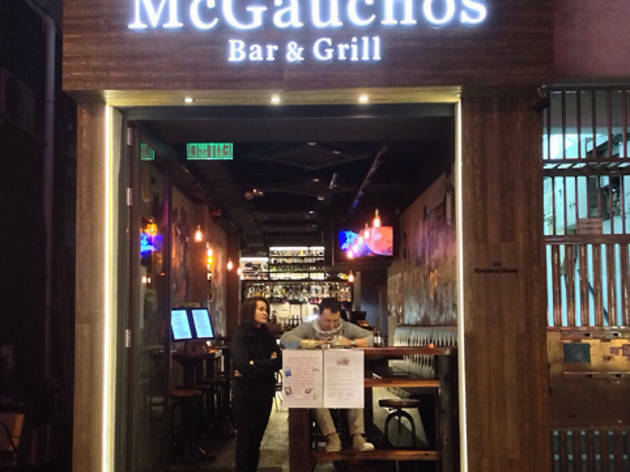 But when we enter McGauchos, the newest member of the Soho scene, this is not exactly what we find. In fact, apart from the smiling cowboy cows graffitied on the walls, there are hardly any Argentinean traces at all. The drinks menu offers an eclectic mix of beverages with a small selection of pretty standard (although misspelled), primarily vodka-based cocktails. They have one of the largest French wine lists we’ve seen in a while and the usual beer and soft drink suspects are on offer as well. Feeling fruity, we go for the Fuzzy Navel ($68) and the Mali Boom Boom ($68). The first combines peach schnapps, orange juice and vodka. We know this is supposed to be sweet but, wow, this is a whole new level of sweetness. Our mouths are bombarded with a ridiculously sugary, artificial orange flavour and a blast of cheap vodka – not an entirely pleasant experience. The second option consists of pineapple juice, sprite and Malibu. This fares slightly better, with the Malibu taking us back to our teenage years, but the drink is overly watery and significantly lacking in pineapple. 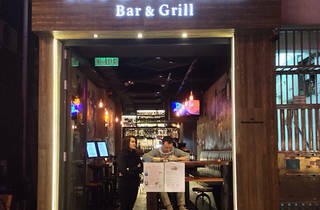 Hoping to balance out all the sweetness with some savoury goodness we take a look at the fantastically tacky backlit food menu, which has everything from nachos to curry beef. With the speciality seeming to be the McGauchos grilled meats, we opt for the mixed meat satay with peanut sauce ($88). The skewers are nicely chargrilled and pretty tasty, with the pork being the definite winner. Sadly, the accompanying peanut sauce is a bit of letdown, though, with only a hint of nuttiness and a gravy-like consistency. McGauchos Bar and Grill 59 Staunton St, Central; 2115 9736.